Trades can never be easy. In order to get something of value, you have to lose something of value and often times more. And so it was for the Edmonton Oil Kings of the WHL in their quest to acquire veteran defenceman and Edmonton Oilers’ prospect David Musil, then of the Vancouver Giants. Many saw this trade as inevitable, as this is Musil’s last season in the WHL, and he was the lone Oiler draft pick that was not playing for the Oil Kings. 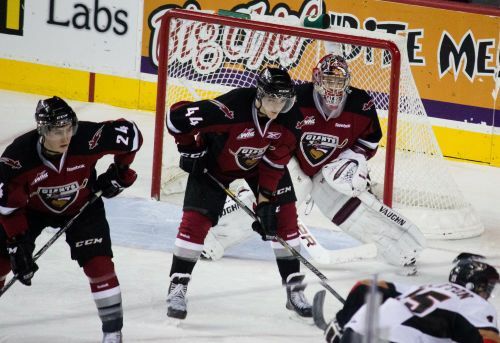 Going to the Giants was their first round 2013 draft pick (a low pick if the Oil Kings make another Memorial Cup run) and a defenceman who looked to be a key part of the future defence; Mason Geertsen. Your typical defencive defenceman, Geertsen’s stats aren’t likely to blow you away. But a quick look at his physical stature might. At only 17, Geertsen was already 6’3” and 200 hard hitting pounds. This of course means that he still has time to grow. In the meantime, Geertsen has never shied away from contact be it a hit or a fight, even if the latter happens with far less frequency. But what is interesting about Geertsen’s fights, is not the so much the frequency, but the circumstances they have come on. For example, 2 of his 8 fights came in one night, and against the same opponent – former teammate Mitch Moroz of the Edmonton Oil Kings. Of course with a statement like that, you have to wonder if there may not have been some underlaying reasons behind the trade, perhaps there was a rift in the dressing room and this was a chance for everyone to be made happy. And even better, after being on a talent rich, top of the league team like the Oil Kings, Geertsen is now playing for the Vancouver Giants, who are in an unfamiliar place in the standings, the bottom. And with that, Geertsen now has the opportunity to really stand out. Regardless of whether or not there were issues in he Oil Kings' dressing room, coach Hay is happy with the addition of Geertsen to his blueline. "We think that he’s a real fine young man and that he’s a real physical defenceman, more of a stay at home guy. "He’s not going to put up a lot of numbers as far as offensively, but he plays well in his own end and he’s a physical guy. He stands up for himself, he stands up for his teammates." Geertsen has been ranked 16 of 25 WHL skaters going into this year's draft, and will make a good physical, stay at home defenceman for the near future in the WHL, and eventually for a professional hockey team. Although Geersten may appear lanky in his stature or play, that is not necessarily a hinderance and in fact just means that he has more to work with as he grows into his body through the next few years, something that defencemen seem to have as an advantage. Because we just accept that defencemen take longer to defvelop to reach the next level, they may be given more time to adjust to their changes in stature. Geertsen's physical play will be what will help him rank on NHL scouting lists, and eventually be called up to the podium in New Jersey this summer. Shouldn’t we preview the 2013-2912 drafts before we look at the 2913 draft? I wonder how many more lockouts we’ll have in the next 900 years. haha! Thanks guys, I have no idea how I didn’t catch that one.